Londoner Rachel Roddy never planned on staying in Rome after her visit to the vibrant city in 2005. But after discovering the charming neighborhood of Testaccio, she instantly fell in love, and thus her adventures began. That was 10 year ago. 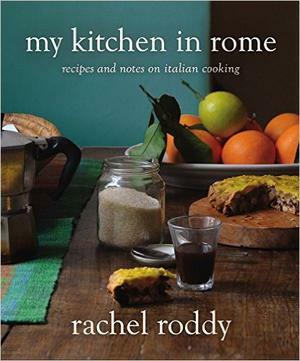 Now Rachel paints a picture of her life as an expat in her new cookbook MY KITCHEN IN ROME, a veritable palate of colorful stories, memories, and comforting recipes. She entices her readers with the flavors of ‘cucina Romana’ without having to leave the comforts of your home. Simple appetizers like Roman-style sweet-and-sour onions and Marinated zucchini with mint will tantalize you, while Deep-fried artichokes and Deep-fried pear (or apple) with pecorino cheese will infuse you with the Romans’ love of anything deep-fried. Roddy’s main dishes range from the light, such as a simple Pasta and potato soup, to the hearty, like Potato gnocchi with pork rib ragù and Fettuccine with rich meat sauce - the latter two of which will make you eager to simmer a sauce all day long. One could make an astounding multi-course meal out of the vegetable dishes alone. Start, perhaps, with a simple salad of Greens with garlic and chile alongside Tomatoes stuffed with rice and a plate of Roman-style artichokes. The unique Braised lettuce with scallions as well as Cauliflower with hard-boiled egg, black olives and anchovy-lemon dressing make us want to throw a dinner party tonight! And dessert, oh her desserts! are a sublimely sweet finish to a wonderfully Roman feast. The Tiramisù, an espresso-spiked treat, will pick you up when you are down; and the Angel wings, a liqueur-infused batter that is deep-fried and sprinkled with confectioner’s sugar, will make your heart sing! Or, how about the Chocolate salami? Mai dire mai (Never say never). Below are two recipes courtesy of the author as well as excerpts from her lovely book, available here on Amazon (now a #1 best new seller). You can also enjoy more from Ms. Roddy on her blog Rachel Eats. I was an extremely diligent and irritatingly helpful little girl who thrived on being given jobs. One of these was being sent out into the garden with the big kitchen scissors to cut a sprig of rosemary from the bush by the garage wall. I took this job very seriously. My brother, Ben, however, took sabotaging it almost as seriously and we inevitably ending up scrabbling in the bush, the strident pine and eucalyptus scent rushing up our noses and the woody branches scratching our calves. The final blow would be Ben, faster and keener, stealing my job by grabbing the branch and taking it into the kitchen to Mum. Despite the childhood bush incident, I like rosemary very much. Romans do too, and pair it beautifully and boldly with lamb, pork, and rabbit. They also put it with potatoes for a quintessential Roman contorno that you find in every trattoria every day of the year: patate al forno (roast potatoes). It also features on one of the best pizzas ever, the unlikely sounding pizza con le patate (potato pizza). In both cases the sap-green and pine-fresh flavor of the rosemary needles jolt the sturdy, yielding potatoes. I have come to the conclusion that the more primitive my oven, the better my roast potatoes. I have never made such good ones as in the comedy gas oven I’m using now. I’m also vaguely cabbalistic about my baking pan, never washing it with detergent and turning it three times before I put it away. That said, I have also asked my entire family to test this recipe in various ovens and various pans. 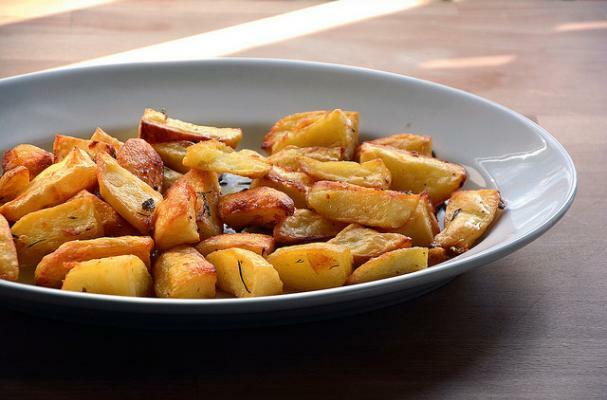 It’s hardly a recipe, just lots of yellow potatoes, peeled and cut into half wedges, tossed with extra-virgin olive oil, good salt, garlic, a sprig of fresh rosemary, and lemon juice, roasted (door opened and pan shaken), roasted (door opened and pan shaken), and served hot. Preheat the oven to 400 degrees Fahrenheit. Cut the potatoes into quarters, and the quarters into eighths if they are large. Smash the garlic with the back of a knife. Tip the potatoes into a baking pan, pull the rosemary leaves off the stem and sprinkle them over the potatoes along with a good pinch of salt, the garlic, lots of olive oil, and the lemon juice. Roast for 50 minutes–1 hour, or longer if they need it, shaking the pan every 10 minutes, until they are crisp and golden. 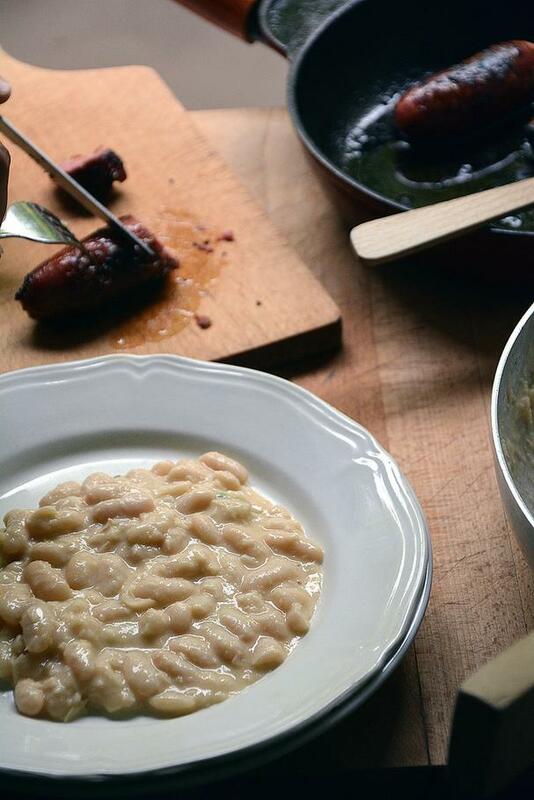 This is perhaps my favorite dish for one of my favorite beans: small, creamy-white cannellini. The combination of beans, some whole and some reduced to a puree, scented faintly with bay and more intensely with sage, and good sausages is a particularly good one. Although you can use ever-helpful and time-saving canned beans, it really is worth soaking and cooking your own beans for this dish. They not only have a better flavor and consistency, but cooking your own also means you can add a couple of bay leaves to the pan, which lend a fragrant and piney note. It also means you have the benefit of the cloudy, starchy bean-cooking water, a little of which, along with the olive oil, gives the beans a creamy texture. It’s important to fry the garlic and sage in plenty of olive oil. The cloves and leaves should sizzle gently in a coat of tiny bubbles until their scent rises fragrantly from the pan. If you come over for dinner there is a very good chance I will serve you this, made with dark cinta senese sausages. If you want to bring wine, a bottle of a Montepulciano d’Abruzzo would be nice. Rinse the soaked beans, tip them into a large, heavy pan, add enough cold water to cover them by at least 3 inches, and add the bay leaves. Bring to a boil, then reduce the heat to a low simmer and cook until the beans are tender, which should take about 1 hour, but will depend on the age of the beans. Once the beans are cooked, stir in a generous pinch of salt and leave them to cool in their liquid. This can be done the morning or day before. Grill or pan-fry the sausages. Peel and smash the garlic with the back of a knife. In a large frying pan or saute pan, warm the olive oil and cook the garlic and sage leaves until fragrant and golden. Use a slotted spoon to ladle the beans from their cooking water into the pan and stir until the beans are warmed through and coated with oil. Transfer about one-third of the beans from the pan to a bowl, add a couple of tablespoons of their cooking water (save the rest for soup), and either mash them by hand or use an immersion blender to reduce them to a smooth paste, then return them to the pan. Taste and season with salt and pepper. Slice each sausage into 3 pieces, arrange 6 slices on a pile of beans, and serve immediately. The above recipe content is excerpted from MY KITCHEN IN ROME by Rachel Roddy. Copyright © 2016 by Rachel Roddy. Used with permission of Grand Central Publishing. All rights reserved.